In-house production of your paperboard can. Discover the new possibilities of differentiation. A partnership that offers you entirely new opportunities. HÖRAUF is an expert in producing equipment to convert paperboard and composite material to packaging cans. OPTIMA is an expert in dosing and filling of a wide variety of products. Together with certified material suppliers you are able to produce your individually shaped packaging in-line, in perfect quality. Do you like to win? 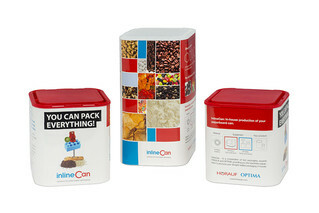 Our customer, NewCoffee GmbH & Co. OHG, convinced the judges of the German Packaging Award with the stylish design of the InlineCan. The smart cardboard can left everyone else behind in the goods presentation category and won first place on the winner's podium. If you also want to inspire consumers and industry experts, we can offer you the right packaging solution.